Toronto’s Pride and Prejudice fans will don their finest gloves and gowns for A Weekend with Jane Austen (April 20“22), a three-day event that celebrates the 1812 Regency era with workshops, lectures, tours, and period costumes. The event is organized by Karen Millyard, a dance teacher and academic who discovered a love of English Country Dancing “ popular during Austen’s time “ while recovering from a bone marrow transplant. 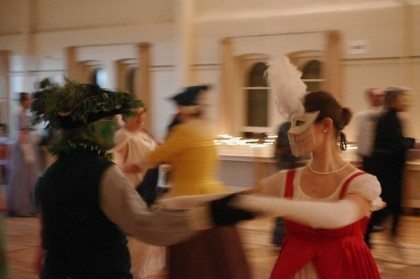 Millyard, who runs dance events throughout the year and is an enthusiastic advocate of the activity, says it’s not just romantics and English-lit majors who show up at her costumed events. “We get a lot of computer programmers “ my theory is that they’re attracted to the dance patterns. They’re very mathematical and balanced,” she says. Millyard admits that there are people who are drawn to the events because of BBC’s 1995 Pride and Prejudice mini-series starring Colin Firth. “It’s possible that there’s a certain false gloss over it “ we tend to romanticize the past,” she says. Click on the thumbnails to see photos from Millyard’s Midwinter Masquerade Ball, which took place on Feb. 18, 2012.